Silk Invest has made the strategic decision to reposition its Frontier Markets fund range in Europe after a successful track record of nearly10 years. During this period, The Frontier Markets have been able to further grow their economies and become an integral part of the global economy. However, international investors have not yet been able to fully appreciate the fundamental changes in these markets and Silk Invest is repositioning its products to make it easier for investors to benefit from the upside of the frontier markets as they catch up with their fundamentals and increasingly come into focus. The African Lions Fund has broadened its universe and will invest globally across all frontier markets that Silk Invest covers. The new fund will be called ‘The Silk African & Frontiers Markets Fund’. The new strategy will maintain its positioning as a broad risk averse frontier markets fund that aims to outperform its peers over the long term. It will continue to focus on investing in local sustainable businesses that are strongly positioned to benefit from an ongoing rise in living standards in our core markets. As part of our repositioning, we have refocused the Silk Road Frontiers Market fund on Africa and have redefined the strategy as a more concentrated unconstrained investment strategy. The new Africa Multi-Alpha fund will be uniquely positioned to give investors access to the most promising investment ideas and will have a total return approach where it can invest in fixed income instruments in periods of market volatility. The investment strategy takes the form of a high-conviction portfolio that will invest across the market cap spectrum in Africa while maintaining its daily liquidity. The fund will aim to generate sustainable long-term alpha across asset classes with lower volatility. 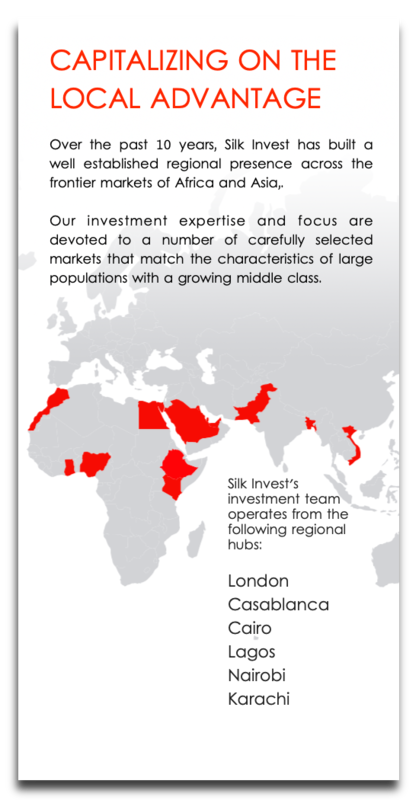 When we created Silk Invest in 2008, we did so to crystallise a worldview that was, and still is shared by the founding members of our team: As millions of people in especially Africa and Asia gradually enter the middle class, there is unprecedented long-term value in investing in the local businesses that are positioned to benefit from this new reality. Africa will remain one of the core regions within the strategy due to the rich bottom-up opportunities within the African universe and our long-term conviction in the growth prospects of the continent. Our approach is quite straightforward: Over the past decade, we have made it our craft to specialise in economies that have large populations served by established local business and entrepreneurs that are ready and able to scale along with an arising local consumer and where there is a functional capital market infrastructure. We have established a network of investment centres in Egypt, Pakistan and Kenya, while our offices in Morocco and the UAE are focused on marketing and operations. As a result, Silk Invest operates with a local advantage when it comes to identifying the opportunities and the local players who can capitalize on them. During this time, we have also established an infrastructure with an operational capability that gives us an edge when it comes to accessing these markets. However, the global market dynamics of the past decade have not made it easy for investors to focus on these fundamentals. For the past few years, we have observed how frontier and emerging market indexes and their providers have been more harmful than useful for frontier and emerging markets. As a number of markets such as Argentina, Pakistan, Saudi Arabia and the UAE, to name a few examples, have migrated between emerging- and frontier market classifications, they have been subject to capital flows that are detached from their fundamentals and merely take place to adjust passive portfolio allocations. While we don’t believe we can alter the way in which an entire industry operates when it comes to market indexes, we do believe there is value in positioning ourselves to work with investors who have the freedom to allocate for medium-term value in the right markets rather than abiding by the shortcomings of short-term nature of market classifications. We do not rely on algorithms or on indexes but we conduct thorough research on micro and macro fundamentals that are driving long-term growth, we don’t invest for the short term, nor do we follow market hypes that could impact the entire industry during several quarters. We rely on our intrinsic local understanding of markets and how certain businesses have the potential to deliver above-average sustainable results. So in summary, the African & Frontiers Markets Fund is now positioned to truly represent the essence of who we are and what we do at Silk Invest: We are opening new routes for investors. Our philosophy, which is built into our company’s DNA, is focused on local entrepreneurs that are best positioned to benefit from a large rising middle class. We operate from and invest in a select number of countries where we have a local advantage.